Scientists have unearthed the fossilised remains of a piranha-like species that they say is the earliest known example of a flesh-eating fish. This bony creature, found in South Germany, lived about 150 million years ago and had the distinctive sharp teeth of modern-day piranhas. These Jurassic marauders used their razor teeth to tear chunks of flesh and fins off other fish. Other fish were found nearby which had been attacked by the ancient piranhas. “We have other fish from the same locality with chunks missing from their fins,” said Dr David Bellwood of James Cook University, Australia, who is one of the authors of the study. The researchers analysed the jaws and found long pointed teeth on the exterior of a bone forming the roof of the mouth. They also found triangular teeth with serrated edges on bones that lie along the side of the lower-jaw. The international team of scientists concluded that the pattern and shape of the teeth, jaw morphology and mechanics suggested a mouth well-equipped to slice flesh or fins. The study has been published in the journal, Current Biology. It shows the remarkable connection between the time when dinosaurs walked the Earth and our modern world. Piranhas attack other fish and tear chunks out of their fins and fin bases. The scientists found injuries in the same places on fish that had been attacked by the pre-historic piranhas some 150 million years ago. “This is an amazing parallel with modern piranhas, which feed predominantly not on flesh but the fins of other fishes,” said Dr Bellwood. It also shows the value of studying fossils, as the area where the fish were found is among the best known fossil locations in the world but continues to throw up surprise findings like this one. Where do we find piranhas in the modern world? Piranhas are now only found in freshwater areas in South America, with some 20 different species found in the Amazon. This is in contrast to the newly described fossil which was found in what was once the sea. Some modern piranhas have been found in other parts of the world but these are believed to be pets that were released into waterways. Not very, despite the best efforts of Hollywood. Piranhas do have very sharp teeth and powerful jaws, with a study in 2012 indicating that the black piranha has the strongest bite found in a living fish. They will eat almost anything when hungry – and there have been fatal attacks on humans, including a six-year-old girl in Brazil three years ago. 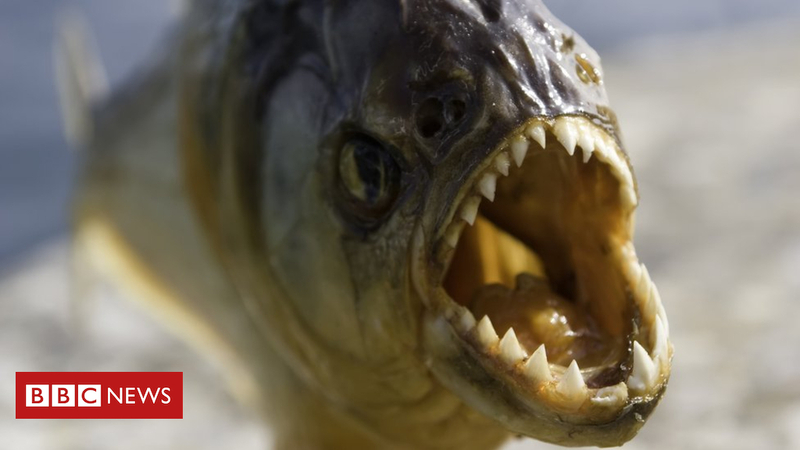 But according to studies, the reputation of piranhas as terrifying creatures is mostly mythical. Some species eat more seeds than meat; some are vegetarian. Where they do eat flesh, they tend to attack dying or dead creatures. The fish will congregate in shoals which some have proposed makes it easier to attack and strip flesh from the bones of other species, but most scientists believe that the group approach is to protect piranhas from predators. Yes! In some parts of South America they are quite popular. Opinions on what they taste like vary. Some say they are like a typical bony, white fish. Others say they are very strongly fish-flavoured. Either way, they are considered a relatively sustainable food, as the creatures are not overfished and are not currently considered endangered by the IUCN.